Thousands March in Taiwan Over Independence, 'Bullying' From Beijing - Integration Through Media ....! 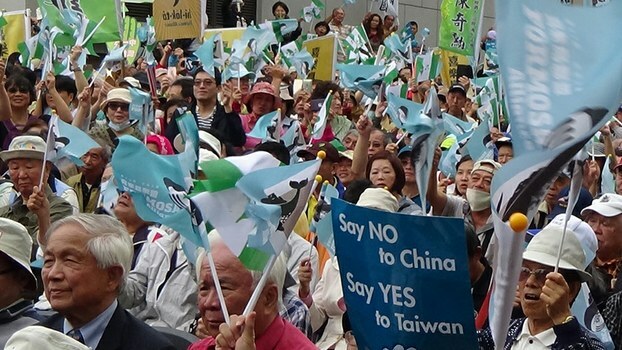 Thousands of people took to the streets on the democratic island of Taiwan at the weekend to call for a referendum on independence, and to protest Beijing’s continuing program of diplomatic isolation ahead of local elections next month. Waving placards that read “We want a referendum!” and “Oppose Annexation!” in a reference to Beijing’s growing political influence on the island, the demonstrators gathered outside the headquarters of the ruling Democratic Progressive Party (DPP) headquarters in Taipei. The Chinese Communist Party has never ruled Taiwan, which has been administered by the remnants of the KMT’s Republic of China since it fled to the island after losing a civil war with Mao Zedong’s communists in 1949. But Beijing sees the island as part of “One China” awaiting “reunification,” and has put pressure on its diplomatic partners to isolate Taipei on the international stage. Recent polls show that the majority of Taiwan’s 23 million population identify as Taiwanese rather than Chinese, and that there is broad popular support for continued self-rule. But Beijing has threatened to invade, should the island seek formal nationhood. “The DPP has written it down in black and white that the future of Taiwan must be determined by the people through a referendum,” Yang told RFA. DPP deputy secretary-general Hsu Chi-ching said a legal amendment allowing the president to allow referendums in situations where the island’s sovereignty or national security is under threat has only been on the statute books for less than a year. Carrying placards of Winnie-the-Pooh—a satirical reference to Chinese president Xi Jinping banned in China—some marchers sought to highlight the opposition nationalist Kuomintang’s links with the Chinese Communist Party in Beijing, and oppose Beijing’s eventual goal of “liberating” Taiwan. Kaohsiung city council chairwoman Kang Yu-cheng said China was using secret financial funds and fake social media and internet accounts to try and influence elections in Taiwan, and called on local people to unite to protect the island’s freedoms, democracy and human rights.